When DaMasta (Daquane Finley) is in concert, you can be sure to expect not only an electrifying hip-hop show with an amazing stage performance, but also rocking a crowd and holding his own is never a challenge for the solo artist, as his varied styles peep the audience’s curiosity from beginning to end. With past albums such as Curse of the 7and In the Darkness, it’s evident that he earns the title DOPE EMCEE. Starting off in a local group called II Far Gone with best friend Unkahmn (Charles Price) during high school in the thriving town of Kankakee, Illinois, the community had yet to see an urbanized talented act emerge to its full potential. Having room for growth and development, the group set out on its journey and later added another emcee/producer Da Ace Man, making the trio complete. 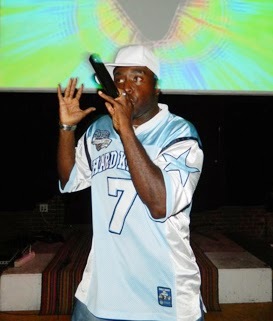 Releasing several albums over the years, such as Domestic Damage and Aint No Way Back, the trend-setters featured a hand full of artists on many of their tracks, bringing forth an origin of new talent. Traveling around the country to open up and meet many great artists, there was nothing that could hold them back. Due to unfortunate circumstances, II Far Gone called it quits after nearly two decades of performing and recording. When Unkahmn and Da Ace Man went their separate ways, DaMasta continued to walk on his journey and followed his vision as a solo artist, continuing to believe in his music. The journey wasn’t easy for DaMasta as many obstacles of life and trust issues within the music industry began to emerge from many angles. However, he did not let these adversities deter him, not allowing any of the ongoing challenges to cause setbacks. Moreover, he was able to recoup due to the group’s break-up and bounce back in his new found home, Cleveland, Ohio. Continuing his career, he has had the opportunity to share the same stage with artist such as Freeway, Killah Priest, Twista, Bone Thugs, KRS-One, MC Lyte, and many local artists whom he has passionately embraced over his career. Now, releasing his third solo album HATRED: Lyrical Therapy, it’s more relevant that he takes hip-hop to another plateau, while continuing to follow its roots. “Shoes-N-Socks” and “What-u-Smokin (feat. Wild Bill)” signifies the true essence of the hip-hop genre and its culture, battling emcees. DaMasta proves that emcees do not have to follow today’s gimmicks to gain recognition as an artist, as he signifies this in “Let It Go,” which acts as a therapeutic remedy for facing conscious issues inside, representing hope and showcasing music’s purity at its best. A history of aggression and the relief of frustration in his lyrical content compliments the tracks, demonstrating that he has creative and articulate rhyme styles. Clever! He delivers unique expressions and potent concepts as he slows down and speeds up the flow to his customized tempo. When it comes to club bangers, “Light It Up” is a must add for your playlist. “Again (Payton’s song)” sets the tone as a dedication to his daughter Payton. HATRED: Lyrical Therapy proves to be one of DaMasta’s best albums yet. Partaking in producing a portion of his own production, DaMasta earns underground emcee of the new decade with the assistance of many talented producers such as DJ-2183, DJ Snow and P.I.G. (Hood Squad Ent.). Support HATRED: Lyrical Therapy, it’s a must have and definitely a breath of fresh air for all hip-hop lovers.